Charlie Austin's second-half penalty all but confirmed Doncaster's relegation from the npower Championship as Burnley collected their third win in four matches with a 2-1 success. Eddie Howe's youthful side are finishing the season with a flourish after a late winter slump saw them slip out of play-off contention. Josh McQuoid opened his Burnley account in fine style and the on-loan Millwall winger's 30-yard volley was the difference between the teams at half-time. The introduction of James Coppinger for injured winger Kyle Bennett at the interval brought about a Rovers revival and the substitute's cross was headed home by Chris Brown to bring the hosts level. Despite pushing for the victory they desperately needed, Doncaster were caught out by Junior Stanislas' clever through ball in the 76th minute and Adam Lockwood bundled Danny Ings to the ground in the area. 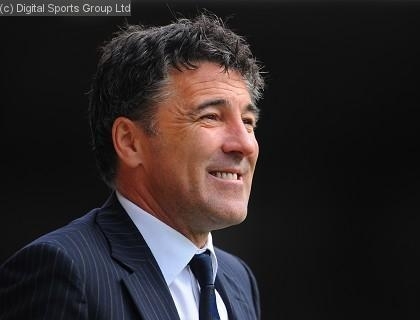 Austin sent Gary Woods the wrong way to condemn Rovers to their ninth game without a win and leave Dean Saunders' men 11 points from safety at the foot of the table with four matches remaining. Doncaster goalkeeper Carl Ikeme paid for a dreadful error in Saturday's 4-0 defeat at Leicester with his place, as Woods started between the posts in one of nine changes made by Saunders. Dean Marney replaced hamstring victim Marvin Bartley in the Burnley midfield - Howe's only change. Ross Wallace was inches away from a spectacular early opener for the Clarets when his sweetly-struck 30 yard effort swerved narrowly wide. As both sides looked to show attacking intent, Burnley settled into a smooth passing rhythm and at the end of one well-constructed move centre-back David Edgar found himself in the Rovers area to head wide a good chance from Marney's right-wing cross. In the 21st minute Doncaster midfielder Simon Gillet exchanged passes with Brown and drew a fine save from Clarets goalkeeper Lee Grant with a stinging low effort. Fabien Robert burst into the Burnley area from the right to send a dipping volley over 10 minute before the interval, but seconds later Rovers were behind. McQuoid was first to the bouncing ball when Grant's subsequent goal-kick was flicked on and he rifled an unstoppable effort into the top corner. Stanislas should have doubled Burnley's lead moments after the restart when James O'Connor's slip allowed him to retrieve Austin's cut-back, but the former West Ham winger hesitated and Coppinger got back to tackle. And Coppinger made his efforts count in the 56th minute when his well-flighted cross was nodded home at the far post by Brown. Doncaster were revitalised and Giles Barnes - a first-half replacement for injured midfielder Brian Stock - headed straight at Grant from Coppinger's free-kick after Burnley full-back Kieran Trippier earned a booking for bundling Robert to the floor. A Burnley response was slow in arriving, but Austin tested Woods twice in a matter of minutes midway through the half - the second save a fine parry to the goalkeeper's right after Trippier's cross was headed goalwards. The home side's comparatively fresher legs made them look the more likely victors, but when Ings got goalside of Lockwood and was brought down referee Nigel Miller had no option to point to the spot, from where Austin calmly converted his fifth goal in four games. Full-back George Friend almost found a second equaliser, with Grant at full stretch to touch his rising stoppage-time drive over the bar.